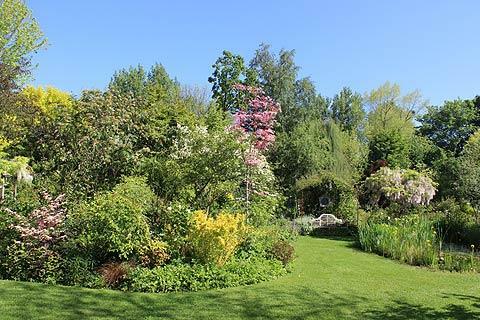 The Jardin des Lianes is a fabulous garden which has been lovingly planted and maintained by its owners over the last 25 years. 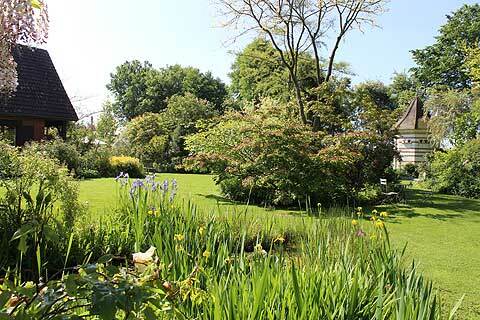 This is a private garden covering over 5000 m2. While the Jardin des Lianes is open to the public now it began life as a private garden developed over time around the owners property. As they worked they have planted the garden in order to provide maximum interest whilst keeping the workload to a minimum. To this end shrubs play a very important role especially shrubs with interesting leaf shapes, colours and variegated leaves. 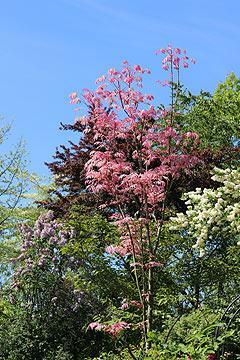 Flowering shrubs are also key and when I visited in May there were some beautiful flowering cornus and viburnum. There are many roses in the garden, more than 450 in fact. 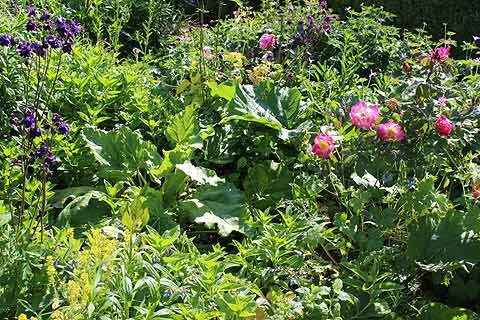 These are mostly ancient or English rose varieties and the scent of the garden in May/June must be wonderful. Over 300 hydrangeas ensure a flowering spectacle throughout the summer and the acers and other shrubs chosen for their autumnal colours ensures a magnificent autumn display. 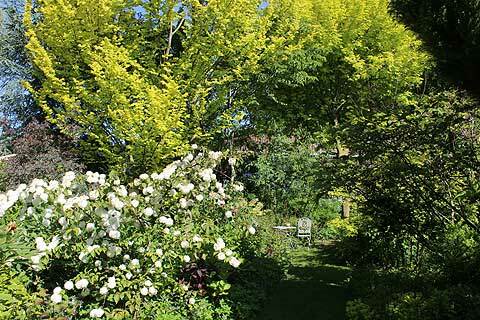 There are many rare and unusual trees and shrubs in the garden and the owner knows all of their names if you are interested. To keep work to a minimum the trees and shrubs in the Jardin des Lianes are underplanted with masses of geraniums, hostas, comfrey and other ground-cover plants. 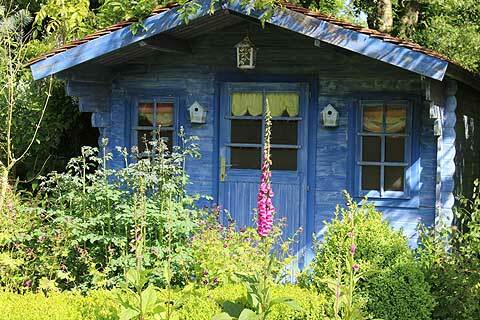 Children will love a view inside the blue cabin in the garden which is furnished as a little country kitchen. 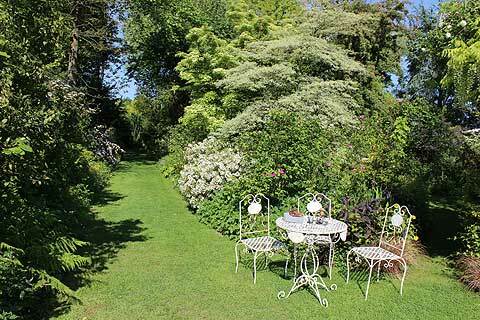 There is also a pigeonnier, a pond and various seating areas adding to the charm of the garden. France This Way comment: whilst I love the big gardens in the area such as Maizicourt and Sericourt I must admit I have a soft spot for the smaller, more personal gardens like this one and I have certainly taken home lots of ideas and plant names to try to put into my own garden. The Jardin des Lianes is open every day except Wednesday from the 1 May to 30 September. 14.00-19.00 weekdays and 10.00-19.00 weekends. The garden is in the village of Cheriennes in the Pas de Calais department of Northern France to the north of Abbeville and west of Arras. Gardeners will want to visit the Jardins de Sericourt and the Jardins de Maizicourt. Be sure to visit the lovely village of Montreuil. You can find more local travel ideas in the Nord-Pas-de-Calais guide.